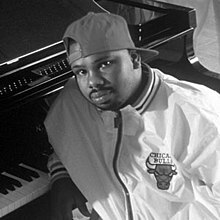 Robert Earl Davis Jr. (July 20, 1971 – November 16, 2000), better known by his stage name DJ Screw, was an American hip hop DJ based in Houston, Texas, and best known as the creator of the now-famous chopped and screwed DJ technique. He was a central and influential figure in the Houston hip hop community and was the leader of Houston's Screwed Up Click. Davis released over 200 mixtapes and was recognized as an innovator mostly on a regional level until his death of codeine overdose in 2000. His legacy was discovered by a wider audience around 2005, and has gone on to influence a wide variety of artists. 3.1 Nationally Distributed Albums before death. 3.2 Nationally Distributed Albums after death. Robert Earl Davis, Jr. was born in Smithville, Texas. His father, Robert Earl Davis Sr., was a long-haul truck driver based in Houston. His mother Ida May Deary (who had a young daughter from a previous marriage), came to the area to be with her mother when her son was born in 1971. She returned to Houston, but the marriage was floundering; soon it would be over, and she and her kids moved to Los Angeles for a couple of years, then back to Houston, and returned to Smithville in 1980 when Davis was age nine. When young, DJ Screw had aspirations of being a truck driver like his father, but seeing the 1984 hit break dancing movie Breakin' and discovering his mother's turntable attracted him to music. His admiration of classical music drove him to resume piano lessons. After seven years of practice, he was able to play works like Chopin's Etude in C major by ear. His musical interest shifted as he took his mother's B.B. King and Johnnie Taylor records and scratched them on the turntable the way DJs did, slowing the spinning disc and then allowing it to speed back up, playing with sound. Davis began buying records of his own and would spin with his friend Trey Adkins, who would rhyme. "Screw had a jam box and he hooked up two turntables to it and made a fader out of the radio tuner so he could deejay." Adkins said if Robert Earl didn't like a record, he would deface it with a screw. One day Adkins asked him, "Who do you think you are, DJ Screw?" Robert Earl liked the sound of that and, in turn, gave his long-time friend a new name: Shorty Mac. "The results of D.J. Screw's labors often sound like rap records played underwater on an old cassette deck that's running out of batteries and needs its tape heads cleaned. It is not music to dance to but music to lose yourself in, as if it is the last sound echoing in your head as you drift off to sleep." Davis began DJing at age 12 in 1983, and started his trademark slowed-down mixes in 1990, the style became his main focus in late 1991 – early 1992. The mixes began as special compilations requested by friends and those in the know. He soon made them available for sale when his close friend Toe offered to buy a mix from him for ten dollars. At that point, customers had increasingly begun requesting his more well-known mixes instead of personalized lists. During the early 1990s, he invited some of the Houston MCs from the city's south side to rhyme on those mixes. This coalition of emcees eventually became the fathers of the Screwed Up Click. Many members of the Screwed Up Click, or S.U.C., are considered key figures in the canon of Houston hip hop. The original lineup included Big Hawk, Big Moe, E.S.G., and Fat Pat, among others. The crew later gained then upcoming artists such as, Z-Ro , Trae tha Truth as well as Lil Flip. His career began to advance once he met Russell Washington of BigTyme Recordz and signed to the label. Davis later moved to a house in the 7600 block of Greenstone Street near Gulfgate Mall. Fans, some driving from far away areas such as Dallas and Waco, lined up at his door to obtain his recordings. He started his own business and opened a shop up on 7717 Cullen Blvd in Houston, TX, called Screwed Up Records and Tapes. It has been shown in numerous music videos and documentaries as well as independent films. In the early 2010s, this location closed. It has since been relocated to 3538 West Fuqua, Houston, TX. Fans may also purchase merchandise, including mixtapes, on the S.U.C. website. There are now several Screwed Up Records and Tapes spread out through Texas, including one in Beaumont and in Austin. On November 16, 2000, Davis was found dead inside of his Houston recording studio in the 8100 block of Commerce Park Drive. Fans speculated about the true cause of his death. When the coroner reports were released, they confirmed that he died of a codeine overdose in addition to mixed drug intoxication. The codeine came from a prescription-strength cough syrup that he would mix with soda to concoct purple drank. In addition to codeine, Valium and PCP were found in his blood. His funeral took place at Mount Pilgrim Baptist Church in his hometown of Smithville, Texas. DJ Screw has been a considerable influence in the Houston scene and beyond, "helping to cement his legacy as an underappreciated avant-gardist, creator of a sui generis sound that’s still growing and mutating." Texas governor Rick Perry honored him by making him an official Texas Music Pioneer. The Houston Press named the 1995 album 3 'n the Mornin' (Part Two) as no. 13 on its list of the 25 best Houston rap albums of all time, crediting the release for the way it helped shape Houston's hip-hop culture. When the Houston hip-hop scene became nationally prominent in 2004, many of the biggest acts could be traced to DJ Screw's crew, the Screwed Up Click. Many artists outside of Houston rap have been influenced by Screw's work, including experimental electronic artists such as Oneohtrix Point Never, Balam Acab, How to Dress Well, and Rabit. The genre sown by DJ Screw has since evolved into a Houston-based subculture that is associated with the recreational consumption of codeine, opulent jewelry and elaborate vintage vehicles. Screw has also left behind a cult following of listeners who self-identify as "screwheads". A music festival and car show in honor of DJ Screw was set up in 2006. The inaugural DJ Screwfest featured 200 vehicles and a set list featuring notable Houston hip-hop acts like Trae and Chingo Bling. The first festival took place at the Pasadena County Fairgrounds. The 2007 documentary film Screwed In Houston, produced by VBS/Vice Magazine, details the history of the Houston hip hop scene and the influence of the chopped and screwed sub-culture on Houston hip hop. The 5-part series devotes one full episode to DJ Screw and includes video footage of him days before his death. The University of Houston Libraries Houston Hip Hop Research Collection  includes the DJ Screw Papers  including approximately 1500 vinyl records owned by DJ Screw, original DJ Screw recordings, photographs, handwritten track lists, and more. Some of these materials have been digitized. Nationally Distributed Albums before death. Nationally Distributed Albums after death. The "Screwtapes" were mixtapes that DJ Screw made himself and mainly sold from his house or when traveling to do shows. Many of his friends freestyled and spoke over the instrumentals and songs. The mixtapes were re-released after his death in 2000 and given "Diary of the Originator: Chapter" titles. Despite this, they were not re-released chronologically. The works date between 1993 and 2000. New chapters continued to be released. ^ a b c Strauss, Neil. "THE POP LIFE; Rap Is Slower Around Houston". The New York Times. Retrieved 13 April 2017. ^ a b c d e Hall, Michael. "The Slow Life and Fast Death of DJ Screw". Texas Monthly. ^ Flashing Back to the Heyday of DJ Screw. Houston Press. July 2009. ^ Life in the Slow Lane. Houston Press. December 18, 2001. ^ a b Caramanica, Jon. "Seeping Out of Houston, Slowly". The New York Times. Retrieved 13 April 2017.